Vancity’s Choose Green videos on YouTube. A recent Choose Green campaign at Vancity included a series of videos with helpful tips about living a more sustainable lifestyle. I just put all six videos on YouTube. Take a look and let me know what you think. Why are we still using paper cups? My friend Ruben has a very insightful article in The Tyee today about the destructive force of paper cups called The 50-Million-Tree Slurp. Well worth a read! Here’s a video from the celebration on Wednesday when Vancity announced it became the first North American financial institution to achieve being carbon neutral. There are so many reasons why I love working at Vancity, and now I have another really big one. 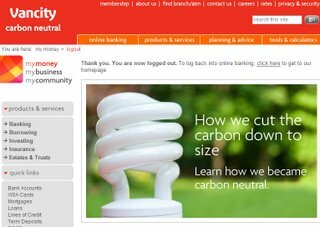 We announced today, after having it externally audited and verified, that as of December 31, 2007 Vancity is offically carbon neutral. 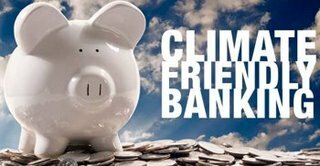 In fact, we are the first North American financial institution to become carbon neutral. It means we’ve tracked our footprint to assess the amount of carbon we emit. Then we focused on reducing our emissions as much as we possibly could. And finally, whatever carbon emissions we could not reduce, we purchased high quality local offsets to bring us to carbon neutrality. This is a huge accomplishment and has been a major focus of the company for quite some time. In fact, we achieved our goal a full two years ahead of schedule by getting our employees across the organization involved and engaged in the issue. A truly great announcement, and I imagine we’ll garner quite a bit of press coverage about it. I especially love our new limited-time carbon neutral logo on the website.